So Eau Parfumée au Thé Bleu not only smells like a variation on Thé Vert, but the citrus - fruit - tea opening briefly recalls another Jean-Claude Ellena scent, Osmanthe Yunnan from the Hermessence series. It stays in that territory for mere seconds before a mild (no claws!) but slightly bitter lavender mutes the impression, and Thé Bleu takes off in its own direction. The bitterness of the shiso and lavender, along with a vague strand of what smells like spiced dried grasses or hay, provide a contrast to the sweeter floral - tea - violet notes early on, and Thé Bleu maintains a lively, herbal aromatic character through the early stages of development. The dry down is softer and calmer, with the whole now cushioned on bed of iris-y powder, clean-ish and a little vanillic. The final stages lose most of the tea, so it's now a quiet lavender - iris fragrance as much as anything else (it reminded me vaguely of Burberry Brit Rhythm; and for anyone who follows Andrier's work for Prada, it could likewise function as an Infusion de Lavande). 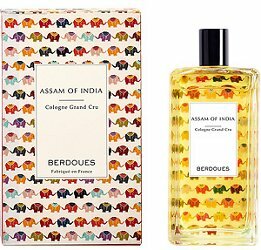 Assam of India is in the recently launched Colognes Grand Crus collection from perfume house Berdoues. I wanted it immediately, partly for the notes (black Assam tea from India, citron and sandalwood) and partly for the bottle (see below), because, elephants. An incredibly kind reader found it on sale at a good price and sent me a bottle (perfume people are the nicest, right?) and lo and behold, the bottle is indeed fantastic (I've kept it sitting by my computer for weeks now, so I can admire the elephants) and the fragrance, while admittedly perhaps not the genius of all genius fragrances, is a very enjoyable summer-y black tea with citrus, sorta/kinda in the same ballpark as the black tea from Speziali Fiorentini or Jo Malone Assam & Grapefruit. Like those two, it is not an all-day affair, but it does better than you might expect, and it makes a decent no-brainer pick-me-up on hot days (especially if you leave it sitting by your computer, where you'll remember to use it). If anyone has tried any of the others in the collection, do comment, and of course, feel free to comment on your favorite tea fragrance (or tea) regardless. 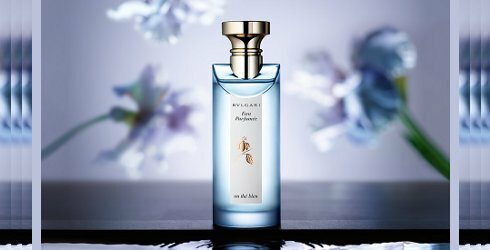 Bvlgari Eau Parfumée au Thé Bleu is available in 75 ($97) and 150 ($160) ml Eau de Cologne and in matching body and home fragrance products. Update: there is also a 40 ml size ($72). Berdoues Assam of India is $80 for 100 ml, and in the US can be found at Beautyhabit or Parfum1. 1. Note that I discovered there was a 40 ml size after writing that. Nobody seems to be selling it online at the moment, but according to the press materials, it does exist. 40 ml is not so bad, although I'd still love to see a coffret of travel sizes, maybe 15 ml? I’m so glad to see a review of au The Bleu! I have bottles of Vert, Blanc, and Rouge and have really wanted to test this one to see if it, too, goes on my shelf. Thanks! All 3! Then you have to smell the Noir, too, when it gets here. I wish they’d left the oud out of that one, but oh well. I have all of them including Black, so I am really looking forward to sniffing this and possibly adding it to my collection. I meant Bulgari Black, which is part of my Bulgari collection. This sounds very good. Victoria was more enthusiastic about it than you are, but otherwise you seem to agree. I hear that there is also a black tea coming out. I’ve yet to try this one though. Thé vert is a staple in my collection and one of the few bottles that has actually been emptied. I’m with you in you adoration of that gorgeous elephant bottle. Cute as a button! I guess I am not “wildly enthusiastic”, it’s true. I think they did a great job — I’m impressed, and I think it’s a great fit with the existing series. I’d wear it if some dropped from the sky. I probably wouldn’t buy it even if it came in a smaller size, and I doubt I will lose any sleep over the bottle they sent me once I’ve given it away. I’ve liked all of the Bvlgari teas, and I love Thé Rouge (I have a bottle and two backups, just in case! ), but I don’t get along with lavender at all, so it sounds like I’ll be skipping Thé Bleu. Not to worry, though. A tea fragrance in an elephant bottle? Oh yeah. That baby’s going to be mine. It is a very soft lavender (surely a molecular fraction), like nearly every modern lavender, but you probably already knew that. So yeah. But I bet there are people who think they don’t like lavender because they haven’t smelled “new” lavender”, just like “new” patchouli. The Berdoues bottle is actually better in person — the juice is really just a very pale yellow, not nearly as “bright” or opaque as what’s shown, so the elephants really shine through quite nicely. I was lucky to find the long-discontinued CSP Thé in a since-disappeared Qatari ebay shop; it smoulders somewhere between L’AP Tea for Two and Ineke Field Notes from Paris. That was a favorite of Kevin’s, too. I am going to send some of the Berdoues to him but I fear it will not live up to his higher standards for a black tea scent. Yes, it was after reading a discussion between Kevin and Carlos on Thé that I decided to track it down. LOL, Kevin definitely shouldn’t try to measure Bleu on his black tea yardstick! It would be silly. Anyway, the CSP had no elephants (although I think you were talking about the Bvlgari, which I will not bother sending him at all). And will point out further that Kevin adores elephants, and so if I sent him the whole bottle he might well love it. But I am not so nice as that. That would be TOO nice, Robin. Carry on enjoying those elephants! Red and turquoise is one of my very favoritest color combos. It makes me happy. CSP used to make some interesting non-vanilla thingies. You’re right, mals – it makes me happy every time I get out that bottle! I’ve been wondering if they’ve started up again — didn’t they change hands (again) recently? I’ve never seen the latest launches in the US though. Red and turquoise were my wedding colors! I never saw those CSP bottles, I bet they are lovely. My first intro to them was vanille coco, so I missed all the interesting stuff. I assume it will be a huge disappointment for someone, right? Testing this one from a sample I picked up at Sephora. On me the violet is very strong–like a violet soap. I am flip-flopping on whether that is a good or a bad thing. ANYWAY, if anyone wants a small bottle of this, Sephora is now selling 10 ml purse sprays for $25.